A simple, safe and cost-free modification to a physical technique used to treat patients in the emergency department with an abnormally fast heart rhythm could improve its effectiveness by more than a quarter, according to a study published in The Lancet today (25 August 2015). An abnormally fast heart rhythm, also called supraventricular tachycardia, can be distressing for patients and many come to emergency departments for treatment. Symptoms can include chest pain, light-headedness, dizziness and breathlessness. Episodes can last from a few seconds or, in extreme cases, for days. A safe and internationally recommended first time emergency treatment is a physical treatment called the Valsalva manoeuvre. This is done by attempting to forcibly exhale or strain while keeping the nose and mouth closed. This physical strain, changes the rate and volume of blood returning to the heart and causes a reflex slowing of the heart rate which can return the heart rhythm to a normal rate. 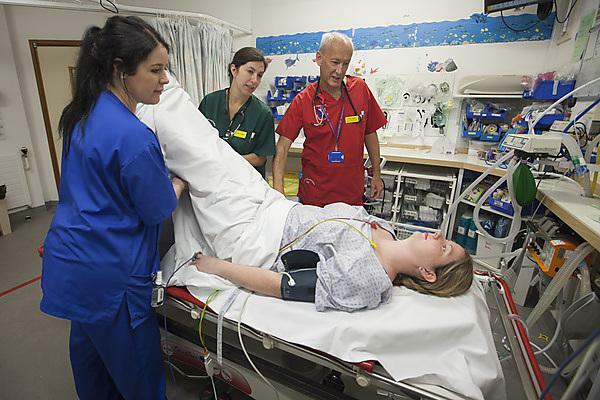 A research team, led by the Royal Devon and Exeter NHS Foundation Trust, have undertaken a study across ten NHS emergency departments involving more than 400 patients, to investigate whether a modification to posture in the Valsalva manoeuvre would improve its performance in treating patients with an abnormally fast heart rate. This is the first randomised controlled trial to assess the effect of modifying posture in the technique. The team were supported by the Peninsula Clinical Trials Unit at Plymouth University and the NIHR Clinical Research Network for the South West Peninsula. They found that by repositioning patients immediately after the strain (laying flat with legs lifted by staff to increase blood flow back to the heart), the Valsalva manoeuvre was much more successful in returning the heart rhythm to a normal rate. In the study, only 17.5 per cent of patients using the traditional posture experienced a return to normal heart rate, while for those using the modified posture the success rate was significantly greater, at 43.5 per cent. The findings of the study are significant, because they identify a simple, safe, comfortable-for-the-patient and cost-free method to improve the success of the Valsalva manoeuvre. This is important because it is a more effective treatment than the standard technique, can potentially reduce the number of patients who require drugs with unpleasant side effects or other emergency treatments, and, because there is no cost, could be introduced worldwide – including areas with limited health care resources.